For centuries, plant-based dyes were the only way to add color to cloth. But in the modern era, they were nearly forgotten as colorfast chemical dyes lured consumers with the promise of easy laundering. The subtlety and depth of color of botanical dyes was nearly lost until textile artists like Asheville’s Barbara Zaretsky revived plant-based dying. She applies her modern design sensibility to natural materials to create refined home accessories, including a line of sophisticated wall pieces, pillows, table runners, and other textiles and wearables. Zaretsky describes her production process as “intentional and responsible,” and she starts by selecting materials. 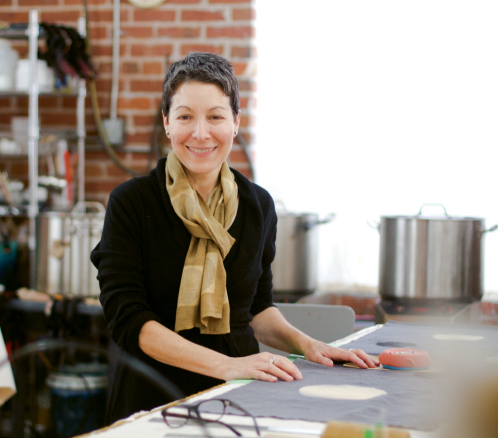 She uses fabric such as natural linen, locally milled or organic cotton, and sustainable peace silk. “These fabrics have character woven into them from the start,” she says. Although Zaretsky also does hand block printing with organic textile inks, in most of her designs, she uses plant dyes made from pomegranate, madder root, indigo, weld, cutch, logwood, or chestnut. Zaretsky dyes the material two or three times while creating a pattern, often through a Japanese technique called shibori. As a finishing detailed touch, she adds hand-embroidered stitching. The style of her accessories is as important as the production process. It’s as much about what’s left out as what’s left in, she says. Her aesthetic is minimalist, inspired by mid-century design, the natural world, and the Japanese principle of ma, a concept of the void between all things. A native of Chicago, Zaretsky came to Asheville in 2001 and was named one of the city’s top five designers by Southern Living magazine in 2010. Helping others learn textile arts is important to her, so she offers classes through Cloth Fiber Workshop, a learning center operated out of her River Arts District studio. There, regional and national artists visit about seven times a year to share their expertise on everything from screen-printing to shibori. In small groups, novices and experienced textile artists build on time-honored techniques and reverse the trend of mass-produced goods with every elegant block-printed pillow or embellished art quilt they produce. Cloth Fiber Workshop offers a natural dyeing class with Catherine Ellis, a Waynesville-based weaver and dyer, March 19-21. For more information about this class and others, visit www.clothfiberworkshop.com or call (828) 505-2958. Learn more about Zaretsky at www.bzdesign.biz.